Pharmacy automation continues to advance apace, both in terms of pure adoption numbers and in the sophistication of application. Key to successful implementations are three relatively simple concepts: pharmacy involvement in vendor selection, committed vendor support during implementation, and the quality of accessible data that enable fine tuning post-implementation. When automation implementations in pharmacy are driven by pharmacy, supported by the vendor, with a system that provides for ongoing improvement, the typical result is high satisfaction ratings. In the second quarter of 2018, Pharmacy Purchasing & Products polled a random, nationwide sample of health-system pharmacy directors. We queried these pharmacy leaders as to their current expenditures on pharmacy automation as well as future budget projections. In addition, we asked about automation usage, staffing levels, and future automation expansion plans. Responses were solicited via email and a total of 367 pharmacy directors replied, yielding a confidence interval of 4.95 (95% +/-4.95) based on the population of pharmacy directors nationwide. The results of our survey are shared on the following pages. We intentionally survey a random sample of pharmacy directors, not just readers of Pharmacy Purchasing & Products, to ensure the data reflect trends across the entirety of US hospital pharmacy practice. Given this approach, we are pleased that 83% of pharmacy directors rely on Pharmacy Purchasing & Products when researching automation purchases. Continual, ongoing progress in terms of new implementations defines many of the automation categories that benefit pharmacy operations. With steady upticks in adoptions, smart pumps, ADCs, packaging operations, and BCMA systems have now all exceeded the 90% mark across facilities of all sizes. These technologies are no longer only available to the largest facilities with strong IT support; rather, they are widely utilized by facilities of all types and sizes. Notable this year are the two categories that experienced significant upticks in system adoptions after demonstrating little growth last year. Both IV workflow management systems and automated drug storage and retrieval systems (ie, carousels and robots) experienced revived interest from pharmacy directors this year. These technologies spiked in popularity, reaching unexpected heights in their adoption rates. Similarly, controlled substance waste systems continue to enjoy sharp increases in adoptions throughout health-system pharmacy. When it comes to access to technology, the historic divide between large and small facilities, academic medical centers and community hospitals, continues to dissipate. Core pharmacy technologies such as CPOE, ADCs, and BCMA are now ubiquitous across pharmacy practice regardless of the facility’s size or location. We look forward to that becoming the case with newer technologies as well, in particular IV Workflow Management Systems and Medication Tracking Technologies, as early adopters of these important technologies have typically been larger facilities. Most automation segments in pharmacy include a variety of products from various vendors, allowing pharmacy directors to choose the options that best fit their needs. The symbiotic relationships pharmacy often develops with their automation suppliers and the intrinsic competition that develops among vendors serves us all when the technology evolves based on user input. 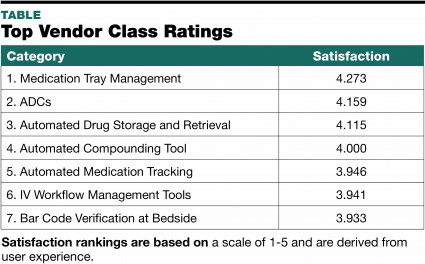 It is notable that the highest rated product classes (see TABLE 1) span multiple areas of pharmacy operations, including compounding, drug storage, and medication management. Fine-tuning technology is an area of current focus for many pharmacy directors, which requires sufficient IT support, and hiring for these positions remains a challenge. Many pharmacy directors are looking to expand their data management capacity, be it by linking smart pumps to the BCMA system or expanding cabinet profiling. Without sufficient informatics FTEs, establishing and maintaining these automation expansions can be challenging. As regulatory agencies continue to focus on safe medication management, there is increasing pressure on pharmacy to ensure and document control. This reinforces the value of automation solutions that simplify this endeavor. As such, we see strong interest in controlled substance disposal products and continued progress in the adoptions of automated temperature monitoring and medical grade refrigeration, underscoring the value automation can bring to improving practices. We know the best results come from technology adoptions that are driven by pharmacy with implementation support from the vendor. Pharmacy must insist that as the end users, they drive the selection process and choose vendors that have strong reputations for customer support. Use the data on the pages that follow to benchmark your own operation, and support your technology acquisitions or expansions. The data is also available in slide format at pppmag.com/slides, which you are welcome to include in presentations that you make internally or externally. We simply ask that you retain the acknowledgement line on the slide. We always appreciate hearing how this information is used to benefit pharmacy, so feel free to reach out and let us know. Deanne Halvorsen is the editorial director of Ridgewood Medical Media, publisher of Pharmacy Purchasing & Products and MedicalLab Management. She can be reached at dhalvorsen@ridgewoodmedia.com.